Neither @OnLeaks or 91Mobiles announced a reason for why the renders leaked yesterday were incorrect. The biggest difference between today’s renders and the old, incorrect renders is that there are now four cameras on the rear of the device. Yesterday’s renders had only a triple-lens setup. Because of the addition of the extra sensor, the shapes of the flash and sensors are a little different, too. However, this isn’t that noticeable. You’ll also notice that even in these new renders, the headphone jack is still there on the bottom. Continue reading yesterday’s article to learn more about yesterday’s renders, but keep in mind that these new ones now supersede the images and YouTube video below. 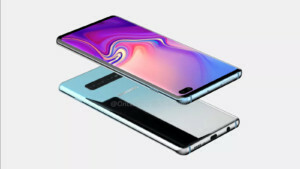 Original Article, December 3, 2018 (07:00 AM ET): We’ve had a ton of Galaxy S10 leaks in the second half of 2018, covering the camera details, model line-up and much more. But we haven’t really had a great idea of what Samsung’s flagship phones will look like.